Fantasy Football Wide Receiver Start/Sit Rankings (Week 5) - Fantasy Football, Fantasy Football Rankings | Mac Bros. Here they are—Wide Receiver Rankings for Week 5 to help you decide who to start and who to sit on your fantasy football team. 1. 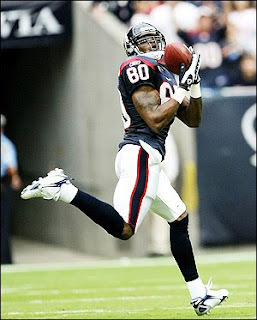 Andre Johnson (HOU) – He has not had a more promising match up since he exploded for 149 yards and 2 TD’s in week 2 against Tennessee. Johnson should shred a shaky Arizona pass defense that ranks 30th in the NFL. 2. Reggie Wayne (IND) – While Wayne does not have the best track record against Tennessee, the 2009 edition of the Titans pass defense is not exactly the beast of yester year. In fact, quite the contrary, the Titans have been torched through the air on a weekly basis en route to the dubious distinction of being ranked as the NFL’s worst pass defense through 4 games. They will be no match for the NFL’s hottest passing attack on Sunday night. 3. Larry Fitzgerald (ARI) – By his own admission, Fitzgerald has slipped a bit in his 2009 campaign. He should find the road to redemption against a suspect Houston secondary. The Texans have yet to face a capable pass heavy offense all season and they will face a monster on Sunday. Fitzgerald is a must start fantasy option for week 5. 4. DeSean Jackson (PHI) – He has totaled well over 100 yards and a TD in his last 2 games and the home run hitting sophomore receiver will likely continue the trend in a promising week 5 match up against Tampa. The Buccaneers have been one of the NFL’s worst defenses this season and have allowed 6 pass plays of 40 yards or more in just 4 games, which is more than any other team in the league. This bodes well for the big play threat and he should prove effective in the ground attack as well against the Bucs anemic run defense. 5. Anquan Boldin (ARI) – When fully healthy, Boldin is one of the NFL’s most dangerous receivers and the good news is that he is 100% for the first time this season heading into a promising match up against a questionable Houston pass defense. This game could turn into a shootout in which case Boldin and fantasy owners alike will benefit tremendously. 6. Randy Moss (NE) – He will have his work cut out for him against a Broncos pass defense that ranks 3rd in the NFL and has yet to give up a passing TD all season. That said, Denver has yet to face passing attack as formidable as the one they will see on Sunday and you can never bet against Moss with Brady under center. As usual, Moss should be a WR1 in your fantasy line up. 7. Mike Sims-Walker (JAC) – Nearing 300 receiving yards with 3 TD’s in just 3 games played, Sims-Walker is clearly emerging as one of fantasy football’s premier pass catchers. We like his chances to keep it going against a Seattle pass defense that has allowed 600 yards and 5 TD’s through the air in the last 2 weeks. 8. Santonio Holmes (PIT) – There is nothing like a match up against Detroit to cure a 2 game hangover. Despite Holmes’ lackluster production of late, this match up should get him back on track. The Lions have been toasted by big play receivers on a weekly basis and have allowed a league worst 12 TD’s through the air in just 4 games. Homes should deliver in week 5. 10. Hines Ward (PIT) – Santonio Holmes may be the big play guy in the Pittsburgh offense, but Ward is still Big Ben’s go to guy. Ward continues to rack up yards and receptions and we like his chances to find pay dirt for the first time this season against an anemic Detroit pass defense that has already given up 12 passing scores in just 4 games. 11. Steve Smith (NYG) – It isn’t incredibly surprising that Steve Smith is fantasy football’s top receiver through 4 games, but no one expected that honor to go to New York Giant Steve Smith. Unfortunately, the odds are a little stacked against him for week 5. He may be without QB Eli Manning and he will likely have to square off against arguably the best lock down CB in the NFL in Oakland’s Nnamdi Asomugha for most of this game. That said, this guy is on fire and the Giants will move him around and find ways to get him the ball. You probably shouldn’t expect him to match his totals from week’s past, but you need to ride the hot hands and keep New York Giant Steve Smith in your starting fantasy line up. 12. Chad OchoCinco (CIN) – His reception and yardage totals have not been much to write home about, but Carson Palmer continues to find #85 in the end zone and there is nothing more appealing in fantasy circles than a receiver that can consistently find pay dirt. While a week 5 match up against the Ravens may prove difficult, we are optimistic that he will be productive. Baltimore still has one of the better run defenses in the NFL, but they are ranked just 23rd against the pass and we have a feeling that Cincinnati will have to go to the air early and often which bodes well for Ocho as the Bengals go to receiver. 14. T.J. Houshmandzadeh (SEA) – He is coming off of his first 100 yard game of the season and there is a decent chance that he could find the end zone for the first time this season in a week 5 match up against Jacksonville. The Jaguars currently rank 31st in the NFL in pass defense and have allowed 7 TD’s through the air. Housh will likely be covered by rookie CB Derek Cox for most of this game and Matt Hasselbeck is likely to be back under center which bodes well. 16. Kevin Walter (HOU) – Considering that the Texans only threw the ball 6 times in the second half of a week 4 blowout against Oakland, Walter’s lackluster performance was not a result of poor play; he was simply a victim of circumstance. It is highly unlikely that Walter will endure a similar fate in week 5 against Arizona. This game should turn into a shootout through the air and we like his chances to rebound nicely against a suspect Cardinals secondary. If Arizona decides to go hard after Andre Johnson, Walter could be in for a huge day, but he should perform well regardless. 17. Steve Smith (CAR) – While he has yet to score a TD and has only one noteworthy game to speak of, Smith is still one of the better receivers in the NFL and we are optimistic that he will breakout sooner than later. In week 5, he will face a Redskins team that currently ranks 4th in the NFL in pass defense, but considering the weak passing attacks the Skins have faced the last 3 weeks (DET, STL and TB), that ranking is a bit misleading. This may not be the safest match up, but it is much scarier on paper than it is in reality. Smith qualifies as a WR2 for week 5. 18. Roddy White (ATL) – He is one of the most talented receivers in the NFL, but White may be a victim of his own success as defenses are throwing everything but the kitchen sink at him these days. He is also the victim of a run minded Falcons offense that has added a star pass catching TE. White is still a WR1 in terms of ability, but under the circumstances, he should be considered a WR2 for week 5 with a tough match up against the 49ers on the road. 19. Brandon Marshall (DEN) – For the time being, all is well for Marshall in Denver as he is once again the big cheese go to receiver. He seen an increase in fantasy production each and every week and it is evident that he is developing a solid rapport with Kyle Orton. That said, he still has some work to do to and we are not extremely fond of his week 5 match up. The Patriots rank 7th in the NFL against the pass and Bill Belichick is a mastermind when it comes to bottling up big play receivers. Marshall is working his way back to WR1 status, but he qualifies as a WR2 for week 5. 20. Pierre Garcon (IND) – He may be just the third option in the Colts passing attack, but there is always plenty to go around with Peyton Manning under center. It also doesn’t hurt that his week 5 opponent is Tennessee. The Titans rank dead last in the NFL in pass defense and have allowed 10 TD’s through the air in just 4 games. Garcon should have plenty of opportunity to produce in week 5. 21. Bernard Berrian (MIN) – The Favre to Berrian connection is starting to heat up and a week 5 match up against a suspect Rams pass defense holds plenty of promise. While we love his potential against St. Louis, this match up is not without some risk. Berrian will still have to compete with Sidney Rice, Percy Harvin and Visanthe Shiancoe for Favre’s attention and the Vikings could shut down the passing attack early if they jump out to a big lead. 22. Dwayne Bowe (KC) – As expected, he wasn’t very good in week 4 nursing a bad hamstring against the Giants top ranked pass defense. Fortunately, things are looking up for week 5. Bowe appears healthy and has a favorable match up against a Dallas pass defense that ranks just 29th in the NFL. He still has to work on his chemistry with Matt Cassel, but he should have plenty of opportunity to do so as we expect the Chiefs to throw the ball early and often in this match up. 24. Nate Burleson (SEA) – He has been incredibly productive in odd numbered weeks so far this season(7 catches for 71 yards and a TD in week 1 and 9 catches for 109 yards in week 3) and we are fairly optimistic that the trend will continue in week 5. He will face a road weary Jacksonville pass defense that ranks 31st in the NFL. 25. Terrell Owens (BUF) – A 60 yard performance in week 4 was somewhat encouraging, but Owens has a long ways to go before he can be considered an elite fantasy option again and that is going to be difficult with Trent Edwards spending more time on his back than upright of late. While T.O.’s talent and a favorable match up against Cleveland qualify him as a low end WR2 for week 5, he has yet to give us much reason for optimism. 26. Santana Moss (WAS) – In spite of the fact that Moss has faced 2 cupcake defenses the last 2 weeks; it is difficult to not be impressed by his 252 receiving yards and 2 TD’s. That said, it’s back to reality in a week 5 match up against a fairly solid Carolina secondary. This is not a match up that Moss can not easily overcome and we like that he carries a lot of momentum into this game, but failsafe, it is not. 27. Mario Manningham (NYG) – He has been down over the last couple of weeks, but if Oakland’s shut down CB Nnamdi Asomugha spends the majority of the day covering Steve Smith, Manningham would likely become the receiver of choice. Even so, this match up has its risk factors. For starters, there is a good chance that Eli Manning will be out and a healthy Hakeem Nicks will cut into Manningham’s playing time. 28. Lee Evans (BUF) – A week 5 match up against Cleveland is his most promising match up to date and Evans is certainly capable and due for a break out game. That said, talent and a good match up do not always add up to fantasy success and Evans remains risky in a struggling Buffalo passing attack. 29. Mohamed Massaquoi (CLE) – There is good news and bad news here depending on what perspective you want to take. The good news is that Massaquoi appears to be Cleveland’s go to receiver with Braylon Edwards gone and Derek Anderson obviously likes to throw his way. The bad news is that Massaquoi is no longer anonymous after his breakout week 4 and defenses will be keying in on him with Edwards gone. The bottom line is that this guy appears to be more than just a one week wonder and at the very least; Massaquoi has earned a shot against a shaky Buffalo secondary in week 5. After all, you didn’t pick him up to leave him sitting on the bench. 30. Patrick Crayton (DAL) – He is the poster child for hit or miss fantasy options and Crayton does not have a great track record of predictability, but we still like his chances for success in week 5. With Roy Williams out or limited this week, Crayton should see a big increase in targets. This bodes well against a very soft Kansas City secondary.